Case1 (dawdling): You Tube returns 19,400 results for Boring Vlog (sept.29.2012). 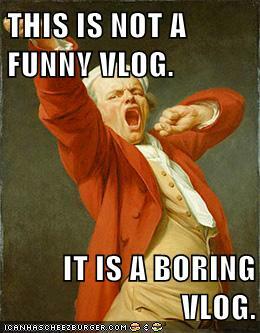 The boring vlog as a form is not always boring, but in most cases is tedious. There is a sort of ethical indifference for the patience of the viewer. Subjected to, sometimes fascinated by a lethargic percolation of lukewarm drift through inconsequentialities complete with an affective yawn. Some are made in sequence – boring vlog #1, #2, #3, etc. This signals a level of formal intentionality; as such,the boring vlog is reducible as genre, brand, or channel. Case2 (dawdling):Poor Willy Wonka!! To witness his cascade into buffoonery… But what of the dawdling on this object (as the caption is the subject)? There are over 127,217 advice animal-like Wonka images online. The formula for the captions is a top caption in the form of a condescending, rhetorical question and a bottom caption providing an insulting compliment. The redundancy and repetition of production (same image, same rhetoric) is a necessary condition to the construction of potential meme; or infact defines them. Though there are many different types of memes using this method, the rhetorical condition vary macro to macro – LOLcats being a common example.